So, you’re interested in developing a microlearning lesson. Are there any microlearning best practices you can use? Of course there are; let’s take a look. To keep it short and sweet, Instructional Design effort must be highly focused on achieving the outcome without frills. For many of us, that is a huge challenge – the usual paradigm of telling a story, the whole story, is compelling. The creation of the lesson plan or Instructional Design (a strategic component). The implementation of the lesson plan in suitable technology for the task. Be sure to understand whether there are various types or levels of learners, their preferred modalities for learning, and the learner environment that could be encountered in the delivery of the microlearning lesson. On the Microlearning Course Outline, this can be addressed in sections “Learner Description”, “Environment for Learning”, “Desired Arousal States”. It is helpful to know all learning gaps and to have a big picture of the subject landscape or processes which will be conveyed, in parts, through the microlearning lesson. Work with a mind-map to visualize the big picture – the content/learning landscape. On the Microlearning Course Outline form, this can be addressed in sections “Course Title”, “What outcomes are candidates for consideration in the course/lesson?”, “How does a proficient individual achieve the outcome now?”, and “What are the current gaps to be addressed in the course/lesson?”. Microlearning focuses your lesson design on the achievement of “just one thing”. Consider how to chunk the content so that you winnow away the “nice to haves” and get to the core outcome that must be achieved. On the Microlearning Course Outline form, this can be refined in sections entitled “Focused Outcome”. Ensure this aligns with your inputs on the current means by which a proficient individual achieves the outcome. Document the key messages, in bullet points, that must be delivered in order for the focused learning outcome to be achieved. Ruthlessly identify all fluff by asking “does the learner need to know/do this to be successful when this lesson is delivered?” and take it out. Make sure you aren’t burdening the learner with more information than is absolutely essential. On the Microlearning Course Outline form, this can be refined in sections entitled “What are the key points or messages to be presented?” and “Chunking”. These messages will be leveraged as a checklist in subsequent efforts in this workflow. 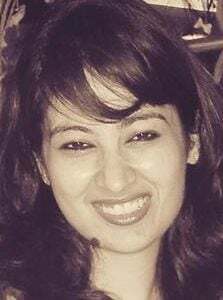 Determine the best platform on which to deliver the key messages so that learning is convenient, in line with current habits, and will integrate well with tools and other learning initiatives. There are many ways to deliver microlearning – but having a known tool set that will help you be effective is critical. 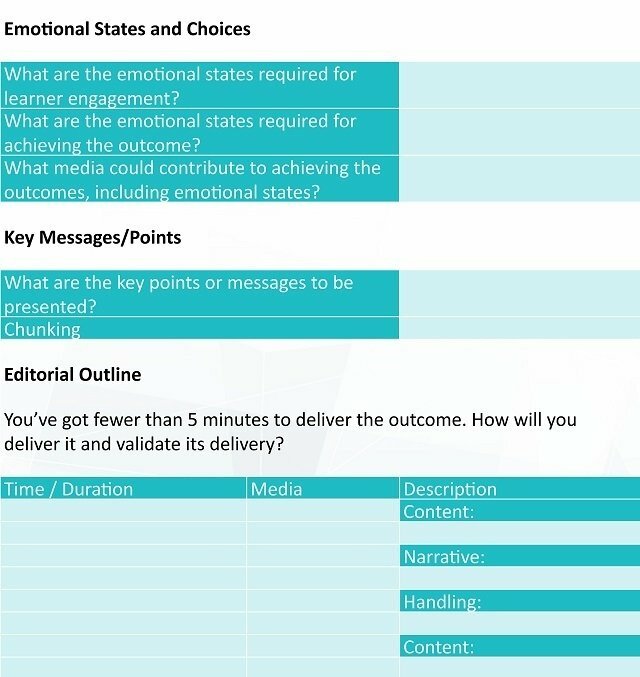 On the Microlearning Course Outline form, this can be refined in the section entitled “What media could contribute to achieving the outcomes, including emotional states?”. The Instructional Designer will also reference selected media in the Editorial Outline for the lesson. Working from your key points or messages, evolve step by step content that addresses your key messages, outlines the media to be used, caps the time allowed for the delivery, and indicates any audio narration or multimedia handling. In many cases, this content originates from something much too long that has been provided by Subject Matter Experts – so you may have some back and forth with (an) SME(s) to gain clarity. Keep a close eye on the time of each key message being delivered. When it runs long, consider whether you are trying to achieve too much in a single lesson against your focused learning outcome. A brief storyboard table can help you document content, media, narrative, and handling. Use expanded storyboards if that is helpful – but beware, typical storyboards can actually prompt you to draw out your content beyond the reasonable intentions of microlearning. Subject Matter Experts are frequently involved in providing the content for learning. Microlearning is an unfamiliar approach for many, so be ready (either during the Instructional Design stage or as you work towards a lesson build) to answer their questions and do lots of training and teaching. If you have the design well documented, you can efficiently develop in the medium or media selected using your tool set. If you are not the implementer of the microlearning lesson, be sure that you at least are familiar with the capabilities of the tool set you will use. Can the tools be used to create video permit interactive branching and on-screen text delivery? What is the range of options in your interactivity builder? Are these tools going to deliver device-agnostic results, or will you be limited to certain screen sizes? Will the tools limit the number of iterations for development efforts? Iterative design is a common notion to most Instructional Designers, but when working with some tools, you need to be aware of limitation. Once that is clear, build, check, then adjust. Normal development processes can apply to microlearning. One of the best professional lessons presented to me was to challenge the value of every word. In microlearning, where the time for delivery is very short, and delivery is commonly to smartphones and tablets, every word used onscreen or in an audio narrative is precious. Be relentless in cutting words where pictures will do. Again, usual composing practices apply to microlearning. Be sure to test solid alphas and betas with others – particularly, if possible, those in the learning target audience. This testing is not just for technical problems – but for content focus, user experience, and even emotional engagement. Remember the emphasis, in microlearning, on just one learning outcome per lesson? Here’s where everything culminates – when the user hits the program’s last screen or page, what is he or she called upon to do? Just as clarity in language and message is sought in microlearning, the learner should have no doubts – and be fully empowered – to act in order for the learning outcome to be fully realized. Borrow here from the marketing playbook on clear call to action. 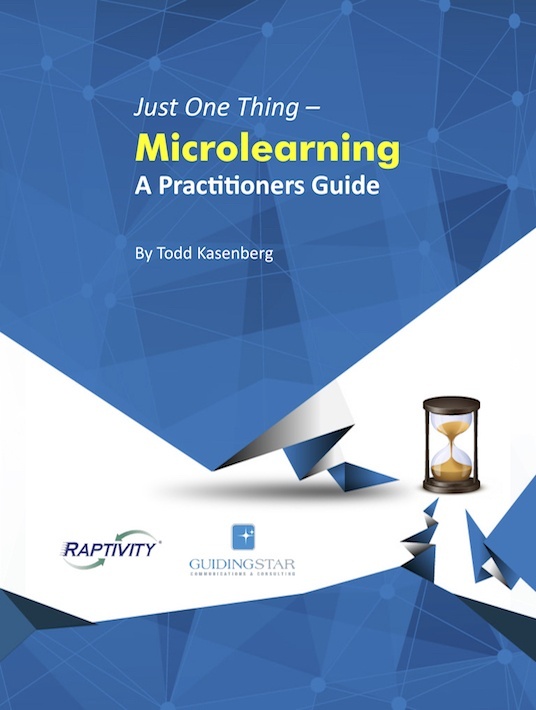 If you want to learn more microlearning best practices, download the free eBook Just One Thing – Microlearning, A Practitioner's Guide!